Judges in The Hague have ordered the International Criminal Court to reach out to victims of war crimes in Palestine. It is a sign the court may be inching towards ending Israeli impunity. The Pre-Trial Chamber is a panel of judges that supervises how the ICC prosecutor’s office carries out its investigative and prosecutorial activities. It has the responsibility to guarantee the rights of suspects, victims and witnesses during investigations by the prosecutor. The decision facilitates the gathering of evidence that could be used in indictments or trials of suspected war criminals. Nongovernmental organizations, particularly the Palestinian human rights groups Al-Haq, Al Mezan and the Palestinian Center for Human Rights, have played a key role in collecting evidence of Israeli war crimes and crimes against humanity that they have handed over to the ICC prosecutor. In September, the groups turned over dossiers detailing crimes of persecution, apartheid, the extensive theft, destruction and pillage of Palestinian property and evidence of the “wilful killing and murder” of hundreds of Palestinians since 2014 in the occupied West Bank, including East Jerusalem. Previously, they gave the prosecutor evidence related to crimes committed by senior Israeli civilian and military officials during Israel’s 2014 attack on Gaza that left more than 2,200 Palestinians dead. While doing this work, human rights defenders have faced death threats and harassment likely perpetrated by Israel or its surrogates. Those death threats have been investigated by authorities in the Netherlands, where the ICC is based. The decision to reach out to victims is causing worry in Israel, as a discussion on Israeli public television channel Kan indicates . . . .
Presenting the Palestinian side of the Middle East, Is it important for a culture of peace? Israel/Palestine, is the situation like South Africa? Yet the Pre-Trial Chamber’s decision does not by itself indicate that the ICC prosecutor’s office, headed by Fatou Bensouda, is about to issue indictments against Israeli war crimes suspects. The Palestinian human rights groups note in their statement that the Pre-Trial Chamber’s order to reach out to victims was not taken by, or at the request of, the chief prosecutor. A preliminary examination is the first step in the process to determine whether to open a formal investigation, which can then lead to indictments and trials. But while a preliminary examination is carried out whenever a referral is made, it is open-ended and can continue for years, at the chief prosecutor’s discretion. 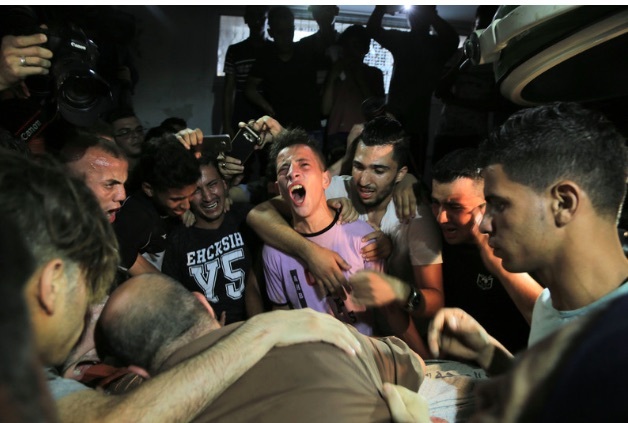 However in April, Bensouda issued an unprecedented warning that Israeli leaders could ultimately face trial for the killings of unarmed Palestinians in the Gaza Strip during the Great March of Return protests that began at the end of March. The chief prosecutor’s warning was surprising given her foot-dragging on the preliminary investigation and her demonstrated reluctance in another case to hold Israel to account. Late last year, Bensouda reaffirmed there was a “reasonable basis to believe” that the Israeli military committed “war crimes” when it attacked an activist flotilla to Gaza in 2010. But she claimed that there was “no potential case” of “sufficient gravity” under the court’s founding Rome Statute to proceed with a formal investigation. Her insistence that the court did not need to act in the case of an extraordinary military attack on civilian vessels in international waters flew in the face of scathing criticism from the Pre-Trial Chamber. In 2015, the ICC judges had ordered Bensouda to re-examine an earlier decision not to proceed with an investigation into the flotilla case. The Pre-Trial Chamber’s decision to reach out to victims in Palestine now shows that even if Bensouda continues to drag her feet, the judges at least understand the urgent need for justice and the importance of hearing testimony from Palestinian victims. In the meantime, Israel continues to create new victims. On Sunday, Palestinians buried Amir al-Nimra and Louay Kuhail, two friends who were playing on the roof of the unfinished al-Katiba building in Gaza City when they were killed in an Israeli airstrike the previous day. Al Mezan reported that the boys were both 14 years old.